Parhoon, H., Masomzadeh, K., Moradi, A., Parhoon, K., Mirmotahari, M. (2016). Effectiveness of mindfulness-based Stress reduction (MBSR) on anxiety, depression and post-traumatic stress disorder symptoms in patients with HIV/ AIDS. International Journal of Behavioral Sciences, 10(2), 129-134. Hadi Parhoon; Kourosh Masomzadeh; Alireza Moradi; Kamal` Parhoon; Masome Mirmotahari. "Effectiveness of mindfulness-based Stress reduction (MBSR) on anxiety, depression and post-traumatic stress disorder symptoms in patients with HIV/ AIDS". 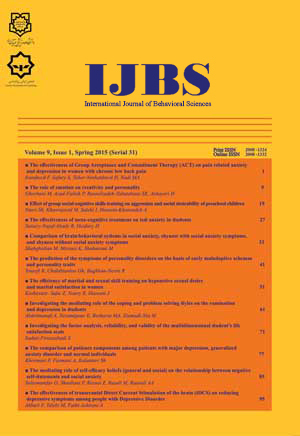 International Journal of Behavioral Sciences, 10, 2, 2016, 129-134. Parhoon, H., Masomzadeh, K., Moradi, A., Parhoon, K., Mirmotahari, M. (2016). 'Effectiveness of mindfulness-based Stress reduction (MBSR) on anxiety, depression and post-traumatic stress disorder symptoms in patients with HIV/ AIDS', International Journal of Behavioral Sciences, 10(2), pp. 129-134. Parhoon, H., Masomzadeh, K., Moradi, A., Parhoon, K., Mirmotahari, M. Effectiveness of mindfulness-based Stress reduction (MBSR) on anxiety, depression and post-traumatic stress disorder symptoms in patients with HIV/ AIDS. International Journal of Behavioral Sciences, 2016; 10(2): 129-134. AbstractIntroduction: Mindfulness plays an important role in improving psychological functions of chronic patients. Therefore the aim of this study was investigate the effectiveness of mindfulness-based stress reduction (MBSR) on symptoms of anxiety, depression and post-traumatic stress in patients with HIV/ AIDS.Method: This was an experimental design with pre-test, post-test along with follow-up group. Using convenience sampling 30 HIV/ AIDS patients were selected. They were randomly assigned into two groups of experiment and control. The experimental group underwent mindfulness-based stress reduction therapy within two months. The scores of Beck Beck Depression Inventory-II (BDI-II) , Beck Anxiety Inventory (BAI) and Impact of Event Scale - Revised (IES-R), were collected from the two groups in pre-test, post-test and in a two-month follow up. Data were analyzed using mixed analysis of variance test. Results: Results in the post-test and follow up indicated that MBSR in experimental group, significantly reduced symptoms of post-traumatic stress disorder (P˂0.05), anxiety (P˂0.05) and depression (P˂0.05) in HIV/ AIDS patients.Conclusion: Results of this study revealed the effectiveness of mindfulness-based stress reduction on psychological functions in patients with HIV. According to these results and the mechanism of its effectiveness, this therapy can have good therapeutic implications.Keywords: mindfulness based stress reduction, anxiety, depression, post-traumatic stress, HIV/AIDS.